If you search your ancestors in Teano, Campania, info about your Italian family are stored in the City Office archives or at the parishes. In towns and villages of Campania and in Caserta province registry offices were established in early 1800: it means that you could find information in Teano registrar as of that date. So, if your ancestors were in Teano in the nineteenth or twentieth century, then you could try to contact the City Office of Teano to know more. Before to start your genealogy research in Teano, we suggest you to read our tips for your search . They are useful to search in Campania and in Teano too. 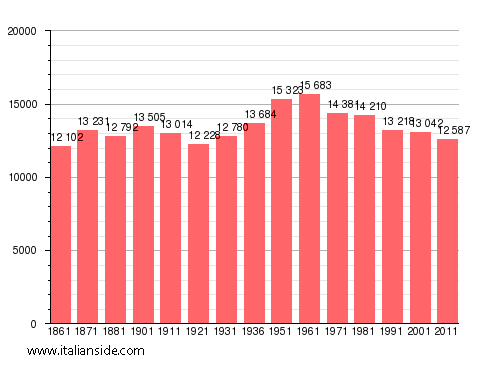 Next picture shows the demographic trends in Teano from the Italian Unification (1861) an important info to understand how many people lived there in the past. It could be important to know if the last name you are investigating is a frequent surname in Teano. As more your surname is common in Teano, as more it could be difficult to find the right info about your ancestors in Teano archives if you have not exact dates. If you have the opportunity to visit Teano and Caserta province, you could plan to investigate churches’ archives by yourself, but from abroad is very difficult to obtain any result unless you find a reliable local help. 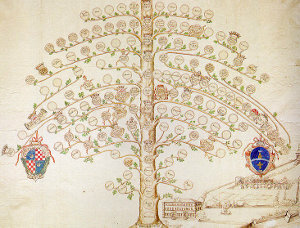 If your research is in a dead end and you need professional help from our local Italian genealogists write to teano@italianside.com our expert in Teano area will study your request and will reply to you with a research plan and a quote. I am seeking a birth certificate for my grandfather Pietro Lepre born in Teano in 1880. His wife Carolina (Ferrara) Lepre born in Teano in 1882 and their first child Vincenza Lepre born in Teano in 1908. I will need these documents in order to apply for dual citizenship. My grandfather, Raffaele Mottola, was born in Teano on 23 February 1885. On 28 October 1913, he left Napoli on the steamship Stampalia to join his brothers Vincenzo and Francesco Mottola in Philadelphia, Pennsylania, USA. He was joined at a later date by his wife Colomba (born in Italy about 1887) and his daughter Filomina (born in Italy about 1910). Any information you can provide on these or any other family members would be greatly appreciated. Baltimore MD buried St. Vincent Cemetery. Nick names Garta/Gavla? I am looking for info on my family last name DiGennaro. My great grandfather marriano was born in 1869. Looking for information related to my grandfather Dominico Boragine who arrived May 9th 1921 at Ellis Island along with his sister Rosa. He was listed as 11 Years old, although there is some debate and his birthplace as Teano. He may have been accompanied by an aunt – a Carmela Scialdone who was married to Nicola Boragine. My Grandfather Mario Boragine and his sister arrived at Ellis Island about the same time. Their parents were murdered and family members sent them to the USA to live with an Aunt who arrived a few years earlier. They resided in Rhode Island and later my grandfather moved to Walpole, MA. In the late 1800’s through Ellis Island. I am 87 years old. Hello Charlotte I also have grandfather Sylvester Teano who had brother Joseph. Immigrated to us 1800’s Had fruit cart lived in baltimore Md. There father Andrew (Andrea) Teano had 4 sons Sylvester A. Teano born Italy 1872, Vincent R. Teano born Italy 1876, Joseph F. Teano born Md 1888, and Anthony Teano Born MD 1886. Sylvester And Wife Honora (Nora) had 7 living children and lived East Mulberry St Baltimore City Md. I believe Teano is your correct last name most first names were changed. I also heard the name Teano had been shorten but not changed. I have more Teano information if you feel this is your grandfather. What was your fathers name? Is your grandfather Carroll Teano Born Baltimore Md 1906? If so My grandfather was Vincent Martin Teano Born Baltimore 1895 his brother. LOL let me know! CAN YOU BE ABLE TO HELP ME FIND A RELATIVE BORN AND PASS IN TEANO ITALY . Was told over my young years that my Grandfather Luighi Antonio Rioles emergratyd from Teano about 1900. I believe that my grandmother, my Uncle Anthony and my father Nicholas were with him. They ended in Providence, RI. My Aunt Angie (Anglia) came over in 1909.. Any information will be appreciated. I am trying to find if I have any relatives in Teano, Italy. My grandfather was Antonio Annaldo (or Arnaldo), DOB: 2/4/?year. Antonio married Lorenza Mancini (born in 1984 and died in Lawrence, MA (USA)in April, 1916. Together they had 4 children; John DOB: 1-11-1911; then after they came to the USA in Dec., 1911, they had Arniboli DOB: 2-16-1913 and Anna DOB: 2-13-15. Their was also a baby girl born April, 1916 who died at birth along with her mother. Antonio Annaldo was my great great grandfather. Do you have anymore information on him? My great grandfather Antonio Longo born abt 1867 married Pasqualina Nardone born abt 1873 both traveled to Providence, RI. He came on the Calabria arriving Mar 22, 1905. She came on the Roma arriving May 25, 1909 with her daughter’s my grandmother Giovannina Longo born Aug 20, 1896 and great aunt Carolina Longo born Nov 29, 1902. My great grandfather had a brother/cousin by the name of Fred Longo born abt 1872. My grandfather Guiseppe De Biasio was born Mar 19, 1887 in Teano came Providence, RI about the same time as Antonio Longo. Guiseppe had a brother/cousin named Pasquale De Biasio. Pasqualina Nardone mother’s maiden name was Conte. Any info greatly appreciated, my Uncle did travel to Teano many years ago and met some family – would love to connect. Searching for any records of Zambelli…especially in San Guiliano, teano, caserta. I am trying to find any detail about my grand-grand father ISAAC TIANO who most probably was born in Teano and immigrated to Salonique (Greece)late 18th early 19th century. If you would like to start a research in Teano please send your request to teano@italianside.com.